Kentucky Fried Chicken is a fast food chain famed for its chicken and chips combo. Various coated joints of chicken and burgers and wraps etc, but usually all served with chips. The new item on the menu is a step away from this, and instead combines rice with their coated chicken; and some salad too. 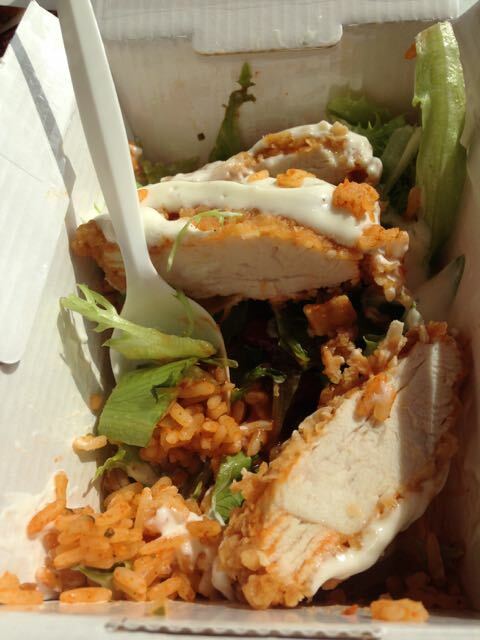 The Ricebox is summery, its lighter feeling and the added salad makes it appear healthier too. It does seem odd to launch it at this time of year, when the summer is ending and the weather is starting to make us think of comfort eating. I think it is nice lunch alternative and picked one up with Spectre, although he had his usual variety meal. When I ordered the Ricebox I was asked if i'd like a side, and for a minute I though the lady serving meant chips, but there were different options, I chose some baked beans. The packaging of the Ricebox is quite smart and reminiscent of american style take away boxes. In side the Ricebox was a large KFC coated chicken breast on a bed of tex mex rice, bean salsa and salad and a hefty does of mayo based sauce. Actually mine had far more sauce than the pretty but thin and neat drizzle on the menu board photo. Underneath all that sauce it was difficult to spot that the chicken was pre-sliced, which is just as well as eating a fully loaded chicken breast with a spork would have been a challenge! I have to admit I found this to be an ideal lunch, the chicken was lovely and spicy, and the sauce was pleasingly cooling. The rice was really good and warmly spiced too, with the bean salsa adding a fab extra tang. The salad was cool and crunchy and added a nice layer of depth to the textures. I’ve discovered, bizarrely through writing at Foodstuff Finds, that I love variations of texture in my food and this totally nailed that. Every bite was different, be it the chicken or the salad or the rice. The Mexican spices left my mouth with a nice chilli buzz and I found myself scraping every last grain of rice up with my spork. Heaven! I hope this is here to stay to be honest, I’m a big fan of these new Riceboxes. 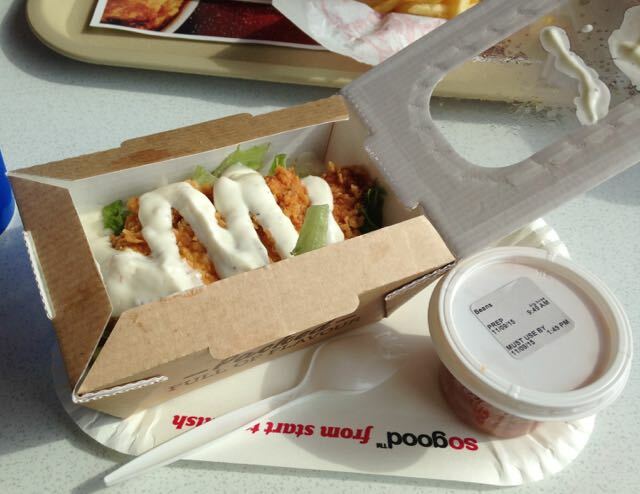 The KFC Ricebox is also available in Original flavour, if you don’t like too much spice, but also a vegetarian option with corn on the cob.